Tickets for the Open Championship at Royal Portrush in July are "almost priceless" following Tiger Woods' spectacular comeback in Augusta. An additional 15,000 tickets were made available for the championship on Monday morning, hours after Woods clinched his fifth Masters title. But the sales site crashed for several hours due to "unprecedented demand". The first batch of tickets for the event, which takes place from 18-21 July, also sold in record time. 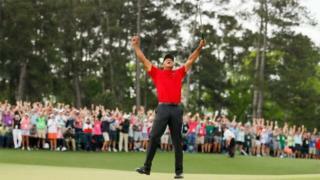 A spokesman for Royal Portrush said: "Tiger Woods' victory at Augusta has electrified the golfing world. His win will resonate over this golf course in July. "The level of excitement has reached a completely new level. "Tickets for the Open are almost becoming priceless." Golf's ruling authority, the R&A, has extended the capacity on each of the four championship days by 3,750, meaning 43,750 spectators will be at the County Antrim course each day. In total, 215,000 spectators are expected to attend the 148th staging of the championship across the week - including practice rounds - as Northern Ireland hosts the Open for the first time since 1951. Former European Tour player and 2003 rookie of the year, Peter Lawrie, was surprised to see Woods triumph after undergoing spinal fusion surgery just two years ago. "I gave him no chance, how wrong was I?" he said. "For all he has gone through and to win the Masters again is great for golf. It brings more people to the game. "Now that he has won, everybody will forgive his indiscretions and realise what a good golfer he is. "We all go through our trials and tribulations, he seems to have come out the other side"
Lawrie, who played in 2005 at St Andrews, when Woods won the second of his three Opens, added: "Two years ago there was no sign of a comeback. It is a remarkable recovery. "Everybody wants to see Tiger play. "Demand for the Open in Northern Ireland was always going to be massive. He has maybe added to it by 20%. "He has done great things for the game."